Hey everybody, happy Monday! Today let’s talk about MEAT. Marinated, chewy, delicious meat! I’ve talked about my protein challenges before; I’m not a huge meat eater. Despite being raised on a steady diet of beef and chicken growing up in the Midwest, in my teenage years and onwards there was something about meat that just didn’t appeal to me. As I work towards weight loss, one of my biggest challenges is fitting in enough protein, as I often order vegetarian at restaurants and cook without meat. Enter an awesome solution: jerky! Before I tasted amazing artisanal jerky, I thought every kind of jerky was the same, that it all had that kind of dog-foody, fake beef smell and weird rubbery texture. Thankfully I now know better, and my mind has been blown by Perky Jerky. I first tried a sample pack at FitBloggin’ and was impressed with how tender their turkey jerky was, and even cooler, it has a kick of a little energy boosting ingredient called “guarana”, something you usually see in energy drinks. I reached out and asked to try some and they’ve been kind enough today to offer one winner a kit of their amazingly delicious Turkey Jerky, valued at $30. Now that you know what you can win, let’s get in to the good stuff – the taste! Introducing the brand new Perky Jerky Flavor, Hot and Bothered Beef Jerky. 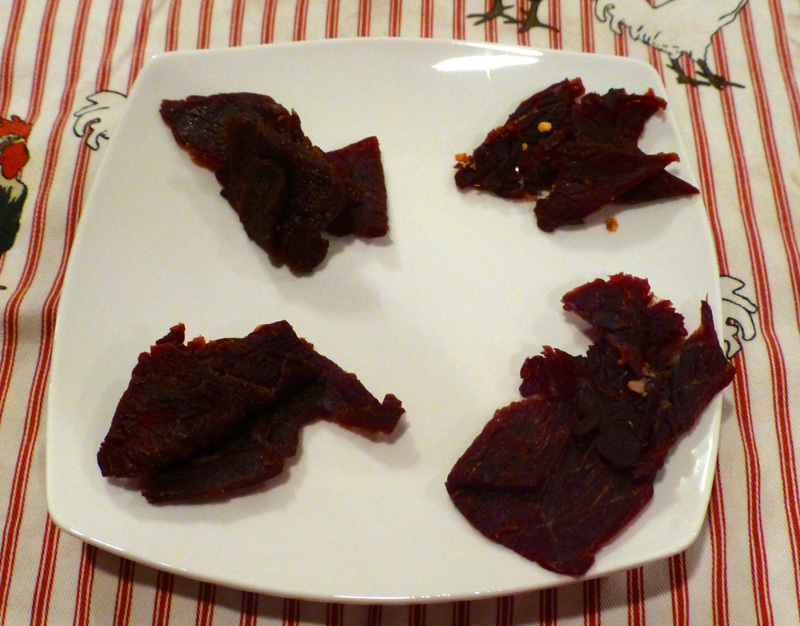 The Hot & Bothered jerky was definitely my favorite of the batch because of the amazing heat. With the first bite you can tell it’s going to be spicy, but not so bad that it’s painful. After the first garlicky bite, you can feel the heat start to creep up your tongue, a nice slow burn, as we chili-freaks like to call it. The spice was intense enough but not too much to make you lose the flavor. I really enjoyed the amount of heat in this one, which leads me to my next favorite, the Sweet n’ Spicy Turkey Jerky. When I first tried turkey jerky, I didn’t know what to expect. In my mind, you wouldn’t see turkey as a meat that would taste good dried, but you almost can’t tell the difference between turkey and beef jerky. The Sweet n’ Spicy has a delicious jalapeno tang, followed by an almost honey-like BBQ taste. It was sooo good and perhaps the “safer” choice for those of you who may not like the idea of an awesome, pepper-punchin’ jerky like Hot & Bothered. Did I mention all of these big bags have around only 100-180 calories per serving? Yeah, awesome. 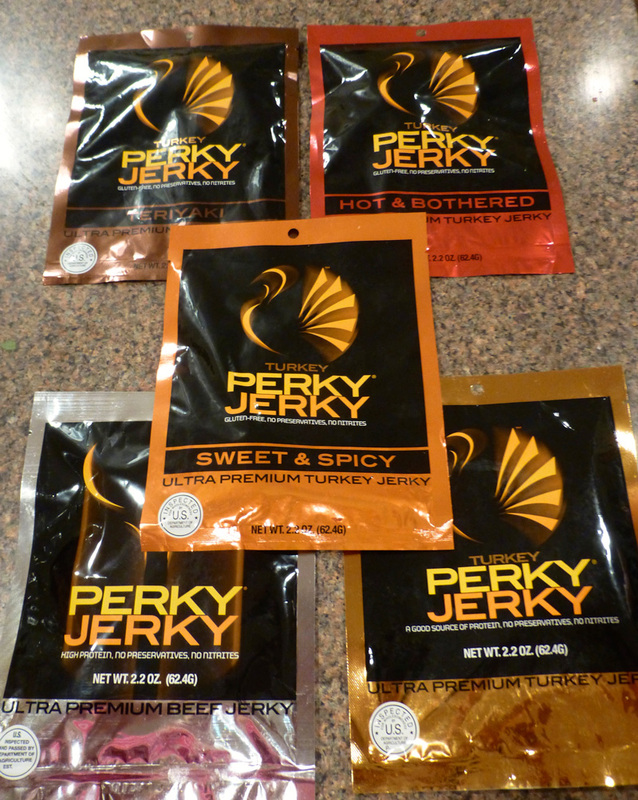 Perky Jerky comes in 5 amazing flavors, including Hot & Bothered and Sweet N’ Spicy. One of the best parts of this jerky (besides the taste) is that the nutritional stats are awesome. The original Turkey Perky Jerky has only 100 calories for the whole bag, which is awesome for people like me that can’t conceive of stopping at one serving. 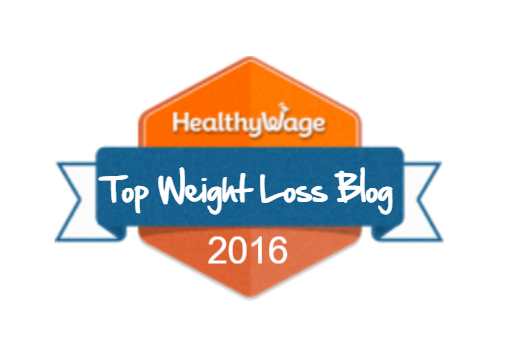 The most caloric flavor is the sweet n’ spicy beef jerky, but even so, two servings will only cost you 180 calories. With upwards of 20 grams of protein, that’s hardly something to worry about. Sodium is a bit high, but you know that will happen with dehydrated meats and jerky in general, so just consume more water to prevent the dreaded bloat. (If I got bloated off this I’d totally make fun of my “jerky jowls” – see, a silver lining in every cloud, right?!) So now that you know Perky Jerky gets the Double Chin Diary stamp of approval, let’s get to winnin’! Ask Lady Luck to pay you a visit by leaving a comment on this post with the flavor you’d most like to try.You MUST leave a comment to be entered to win. That’s all ya gotta do, but if you want more chances, you can do the things below! “Like” Perky Jerky on Facebook. Please let me know what actions you have taken and I will make sure to count your extra entries in the final tally! This giveaway will end on July 15 at 11:59 pm and is open to US residents only, ages 18 and up. Perky Jerky did provide me complimentary samples in exchange for this review, but as usual, if something tastes yucky or is made up of BS claims, it won’t receive the Double Chin Diary Stamp of Approval, nor would it be available for you to receive as a giveaway item. GOOD LUCK! This entry was posted in Giveaway, Review and tagged artisan beef jerky, beef jerky, beef jerky health food, double chin diary review, energy enhanced jerky, energy jerky, giveaway, guarana beef jerky, high protein snacks, perky jerky, premium jerky, protein snacks, turkey jerky. I would like the sweet and spicy, please. Already like Perky Jerky. I would love to try hot and bothered! I love the original Turkey <3. Sweet and spicy for me please! Yummmmmm …..! I would love to try the Sweet and Spicy- yum! Hot & Bothered for sure! I’ve never tried this before! Teriyaki sounds fabulous to me! I like Perky Jerky on Facebook! I follow Perky Jerky on Twitter via @serene_streams! Sweet and spicy sounds amazing! As a die hard carnivore, I’d love me some Hot & Bothered…. I want some of that sweet n spicy jerky. that sounds exactly what I’ve been craving for, I also tweeted, & liked their page! I’d love to try the Hot & Bothered – I love spicy! I’ve been eating Turkey Perky Jerky for over a year now, I’m excited to learn that they have flavors. My husband and I liked it so much that we even put it on our wedding registry! I like Perky Jerky on FB too! Thank you! I’d love to try the teriyaki flavor. I “follow” Perky Jerky on Twitter as @wizardewu. I “Like” Perky Jerky on Facebook as Eugenie Wu. I want to try the Sweet and Spicy. I “follow” Perky Jerky on Twitter (leedhowell). I “Like” Perky Jerky on Facebook (Patrick Howell Lee). Oh man, I love jerky. It’s my favorite “road snack”. I’d love to try the sweet ‘n spicy. I like Perky Jerky on FB too. Thanks! The sweet and spicy variety is the one I am most interested in. I saw Perky Jerky at the store for the first time and ]debated about getting it (really jerky picky)now I may just have to try some! Hot & Bothered sounds like the one I’d want! 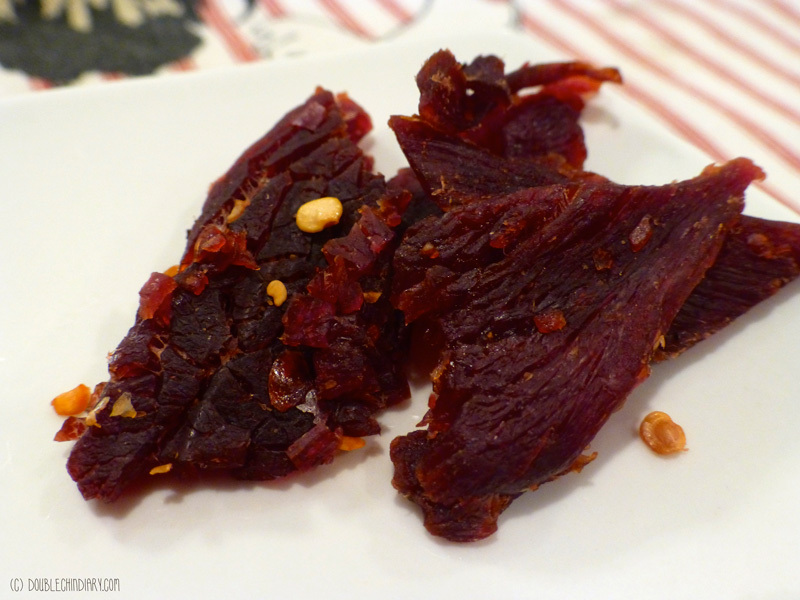 I want to try the Sweet & Spicy Perky Jerky Beef. I like Perky Jerky on FB. I would love to try the Teriyaki!! I love jerky 😉 Nice to know it can be eaten without too much guilt! I’d love to try the Turkey Perky Jerky. Thanks. “Follow” Perky Jerky on Twitter [@tartbutsweet]. Follow @DoubleChinDiary on Twitter [@tartbutsweet]. “Like” Perky Jerky on Facebook [Vicki Furrin]. I think Id try the original beef jerky or the teriaki because I dont like spicy. i follow them on facebook as kelly mcgrew. I’d most like to try Ultra Premium Turkey Jerky. Like Perky Jerky on Facebook. I like perky jerky on F B.